Armor Critical is based off the game that started it all for popcap games. Its original name was ARC (Attack Retrieve Capture) was created by the original popcap founders in 1995 and has been hosted on severl gaming networks such as WON and Sierra before no longer being supported. Some members of the community made a clone of the game and was a client called "Spark". Spark has since been modified to work as an embeddable java app so its easier to access on the web. The game is easy to play yet addictive for many. Its a real time action game where there are usually 2 teams but there can be up to 4 in any given map. 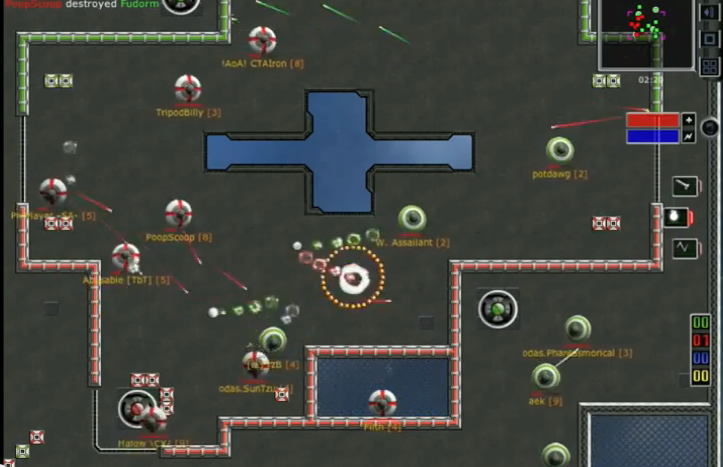 You can shoot lasers, missles, bouncies and nades at your opponents in real time. When you die, you simply have to wait a predefined amount of time (usually less than 20 seconds) to respawn. Capture the flags and return them to your teams base to win. Hundreds of different maps and the ability for players to easily make their own maps as well as about half a dozen different game modes make this game a classic and is why the community currently consists of many members who have been around for over a decade. Computer: A microwave with stuff that resembled circuit boards from a computer. OMG! An ARC clone! This was one of my all-time fav games back in the 90s. I loved it's level editor, and the multiplayer was great! haha raymond. That map editor is still the same one being used. All the maps and programs are fully compatible. Stop on by and say hello. I might just do that later, I like a good nostalgia trip every once and a while. ARC is/was a real gem, it's a shame that almost no one outside of the ARC community knows what it is anymore.